The future of tax preparation. Now. (PRLEAP.COM) This is a letter from our CEO to our Investors and Future Investors. Thank you for your continued support of Happy Tax. I'd like to give you an inside view of what's happening here at the organization, along with our vision for the company and the entire tax and accounting industry over the next decade. I'll start with some key highlights. Our fiscal year ending April 30, 2018 sure was exciting. Our revenue grew by 123%. The number of tax returns that we prepared increased by 1,040% (an appropriate number since the 1040 is our favorite form!). Our number of partnership agreements grew by 84%. On Facebook alone, we reached over 10,000,000 unique people with our posts and ads in the fiscal year, and we are up 35% in reach this fiscal year to date so far. Our websites and YouTube channel has also grown significantly in relation to our traffic on those platforms. Opportunity Tax is our retail brand for converting independents to join Happy Tax to improve their businesses and get into new markets with our tech-forward model. We acquired the assets and franchise agreements of Opportunity Tax from the exiting franchisor. CryptoTaxPrep.com launched and instantly became the industry leader in cryptocurrency tax preparation, a niche with a large and growing demand and a low supply of practitioners to service those clients. Finally, CryptoTaxAcademy.com was incubated during the fiscal year and launched this past summer. It helps teach our growing tax and crypto reconciliation departments-along with other practitioners-the practical how-tos and intricacies of preparing crypto tax returns. The tax industry isn't just changing; there is a tidal wave coming that will forever change the current competitive landscape and the way taxes are done. Between 2012 and 2017, retail tax operations suffered a 28% reduction in returns prepared (source: Page 23). Yet during the same time period, independent tax business owners are flat. Independents currently control 90% of the assisted side of the business vs Block, JH and Liberty (up from 85% a couple of years ago). Part of the reason for that is relationships. This is why the chains are suffering (along with some mismanagement). It's also why we heavily leverage relationships in our tech-enabled services model. It is estimated that 20-30 million fewer taxpayers will have to file Schedule A Itemized Deductions based on the new Tax Cuts and Jobs Act (TCJA). Even before we talk about those that are going to move to do-it-yourself as a result of that, let's talk about an easily quantifiable metric: The average price for a Schedule A form add-on fee across the industry is $100 (the vast majority of preparers charge by the form). Based on this metric alone, $2-3 billion dollars of revenue is about to evaporate from the assisted side of the industry. The assisted side was previously at $17 billion in revenue, so this hit is substantial (to illustrate, I've attached a detailed tax industry graph we put together a couple of years ago). There will also be, in our estimate, at least 4 million people who are going to move to DIY from Assisted this year due to no longer having to itemize. 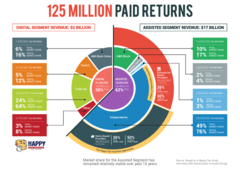 These lost returns create at least another approximate $1 billion in lost revenue for the assisted side of the industry. In order to counter this loss of $3-4 billion (possibly up to $5 billion), some of the larger firms or smaller practitioners may attempt to bump up their base pricing to compensate. However, that is not a viable long-term strategy and will continue to push customers away to alternatives like independents, DIY and technology-forward solutions. To summarize, the TCJA could result in another 17-30% decline in revenue for Assisted in 2019 alone, on top of the prior 28% decrease. Much of that will likely be a direct hit for the storefront preparers and chains as the existing downward trend in that portion of the assisted segment continues (and possibly accelerates). Without substantial improvements in business models of these incumbents, it will likely get worse in future years for all that carry significant overhead expenses. We are uniquely suited to thrive in this scenario, having both advantages over the independents who are not built for scale and advantages over the incumbent national chains who are burdened by a model built around storefronts. Our virtual model has the best of all worlds: relationships first, tech-forward, lean overhead. There are clearly two behemoths in the tax industry, Intuit's TurboTax on the Do It Yourself side and H&R Block on the Assisted side. Both have been in those positions for decades and have fought hard to protect their respective positions. They are well-respected companies with strong revenues and loads of cash to throw at maintaining their predictable cashflows. There are some interesting initiatives happening at both of them, though, that speak volumes as to why Happy Tax is the future of the tax preparation industry. Turbo Tax is moving more towards Assisted and H&R Block is moving more towards DIY. Both are moving towards the Happy Tax Hybrid. TurboTax is trying to move into the Assisted segment with their TurboTax Live product, and H&R Block is trying to put more emphasis on a hybrid approach with a self-submit product called Tax Pro Go. Both are missing out on one key component to the equation. That key component is the same reason why 90% of the Assisted side and the vast majority of the revenue in the paid tax prep industry goes to Independents: the client/service provider relationship. Intuit has said on their investor calls that they are trying to grab a part of the previously $17 billion in revenue from Assisted with TurboTax Live. The problems with this are numerous. Clients still need to do their entire tax return themselves and then can have a CPA or EA review it or possibly make a small change for the client. It is basically Do-It-Yourself with some help. The majority of Americans choose Assisted because they don't want to do it themselves. It takes too much time, it's too intimidating, there are too many tax laws (70,000 pages worth). I think Intuit is doing a great job with their company; however, this new product of theirs will not encroach on Assisted to any meaningful extent. H&R Block has set up an app that enables their clients to self-submit their return to one of their offices for preparation by one of their preparers. The return is prepared by a tax professional within seven days after submission. They are attempting to put some of the information gathering and submission burden on the client while still utilizing one of their tax preparers at their offices. The first thing here that doesn't work is the time lag. For the typical Block customer, there is more urgency in getting their return prepared. From a customer experience perspective, it may be better than spending half a day in an office, but they seem to be lacking the infrastructure to roll this out effectively within their existing retail structure. In fact, their CEO Jeffrey Jones has said "We aren't as relevant as we need to be to today's consumer" and this product wasn't even mentioned again by the company after its initial announcement in December of 2017 (including in their SEC filings for the season) so how they executed on its roll-out is unclear . The customer relationship is the holy grail, and both of these entrenched players are missing that, which is why these products will not achieve what the companies think they will. We are the missing hybrid as we combine the deep client relationships of our franchise partners, a tech-savvy approach and a more convenient way for consumers to file. We are currently focused on enhancing our client experience with additional technical capabilities and innovations, while staying dedicated to creating the happiest tax return preparation process ever known. Our three primary revenue drivers of concierge service through our franchisee network, our direct-to-consumer initiatives at CryptoTaxPrep.com, and our newest revenue generator at CryptoTaxAcademy.com are all growing and scaling sustainably. Our franchisees and their contractors are also doing an amazing job locally of gaining their share of this emerging market. Our next step is to raise institutional capital to accelerate this growth and position us for true market leadership, making Happy Tax a household name. Our business models are built to be in line with the way our customers want to interact with a service provider. We are not adjusting the process; we are redefining it. Not on our terms, but on the terms of our clients whom we love. Our window of opportunity is now, as larger players attempt to marshal their resources to pursue the online opportunity and as customers are currently receptive to forming new relationships with new tech-enabled services like Happy Tax. As the competitive landscape evolves, our goal is to move quickly to solidify and extend our positioning while we continue to grow by referrals and increased marketing spend. We see substantial opportunities in the large markets we are targeting to become a dominant force and reward our investors. We are currently making a number of technology upgrades including a unified platform, single sign-on, reporting enhancements and multi-factor authentication. These will enable us to create more efficient workflows along with usability, marketing and productivity enhancements. As with any new idea, of course, there is risk involved. Defining a new segment in an entrenched industry requires capital and proper execution. Thus far, we've been able to achieve our results and successes without significant capital investment. In order to achieve our vision at scale, we'll need to begin pursuing these investments, which is very much on our radar for the next 12 months. Helping entrepreneurs to start their own Happy Tax business has been a significant revenue driver for us and we are bringing on many new franchisees regularly. For a number of reasons which I will outline here, we will be increasing our franchise fee at the end of this franchise selling season. First off, we are priced significantly under our other brand competitors. When we first started out, we needed to keep our price lower in order help kickstart the brand. Now that we have made a significant market presence, proven our model and actually shown that our model is superior to the declining brick and mortar, the time to raise our upfront franchise fee is now. Our model is still a very low cost to startup compared to most franchise offerings. We will be raising our franchise fee from $20,000 to $30,000 and also increasing the per person in population price on our Area Representative deals. The team we have assembled is unlike any other executive team in the industry. A mix of tax professionals, entrepreneurs, and passionate individuals with a burning desire to fulfill our mission. I'm so proud of what we have accomplished together, and we are only just getting started. Together, we'll continue to solidify our brand, tweak our processes, enhance our tech, and work towards the highest customer satisfaction ever seen in an industry that typically has trouble creating pleasing client experiences. We'll do so through our innovations and our authentic and fun marketing. With the gig economy continuing to expand, we are well-positioned both to attract new franchise and independent contractor partners and to service those individuals whose taxes become more confusing with self-employment tax obligations and the new 199a deductions for businesses hiring independent contractors. As the impact of TJCA tax reform simplifications and lost revenue starts to affect the marketplace, it will have the greatest impact on our competitors that operate with the unnecessary overheads of retail or office space. In fact, it is very possible that one of the three largest companies on the Assisted side will collapse in the next five years. I'm still not sure which one yet as the marketplace will have to make that decision along with how those firms are managed. We'll continue growing our team with the right mix of core team members and tax professionals in order to handle our continuously increasing volume of tax returns. As our brand name grows stronger, more existing tax and technology professionals are approaching us to work with us and our innovative recruiting and on-boarding methods have served us well to always make sure that we have enough staff on hand. We'll be working on adding some new technologies into our process in 2019 including OCR to streamline tax document entry and machine learning, which is included in our pending patent, to enable automatic and intelligent routing of tax returns in our assembly line process. We believe that after we achieve an institutional funding round which we would like to close by 2019, we will can grow our business to $40 million in revenue in 5 years with sustainable EBITDA margins of 30%. Henry & Richard Bloch were the original innovators in the tax industry back in 1955 when they invented the assisted side of the business. That mantle has now passed to Happy Tax. In fact, it seems to have been foreshadowed it in the title Henry Bloch's book: Many Happy Returns). We see a perfect storm in the tax industry that favors Happy Tax over the next 5 years. Retail is getting crushed. The majority of practitioners are older and many will be leaving the business as a result of getting on in age and tax law changes (especially this year). And consumer behaviors are continuing to shift towards tech-forward approaches that still offer concierge, done for you service. We not only prepare taxes and empower entrepreneurs. Our model creates time for what matters to both sets of our customers. And that's why we will continue to gain share and beat our competitors. Cryptocurrency taxation has moved out from the shadows 2018. Over three million cryptocurrency transactions take place each and every day (that totals over one billion per year). Each of these transactions are tax reportable events generally subject to either capital gains and losses or self employment income. Every major financial services company in the country including American Express, Fidelity, TD Ameritrade, JP Morgan, Bank of America, the New York Stock Exchange and all of the Big 4 Accounting Firms as well as all of the major technology companies like Google, Facebook and Amazon are investing in blockchains. In 2014, the IRS ruled that cryptocurrency is property for the purposes of taxation. In 2016 after analyzing their data and only finding that approximately 800 people included their cryptocurrency trades, the IRS sued Coinbase to turn over the data of their millions of clients. The IRS won that case in November of 2017 and Coinbase turned over the data of their larger customers from 2013-2015, well before crypto hit mainstream in 2016/2017. Coinbase currently has twenty-five million customers and the number two cryptocurrency exchange binance currently has just under ten million customers. The IRS is currently working on sending out letters to the thousands whom they received data for and we feel strongly that this will open up the floodgates of other cryptocurrency traders not wanting to get into the same trouble to seek out professional assistance. We have already positioned ourselves as the industry leaders in crypto tax and accounting generating over one million dollars in revenue in our first tax season preparing these types of returns. Most practitioners do not know how to prepare the data properly for these types of returns and those that do are not built for scale like we are at Happy Tax. We have also saved our customers over twenty million dollars in taxes during that same time period by implementing accounting methods most other practitioners are not equipped to be able to implement. We are helping individual traders and small entities and even received a handful of referrals from Big 4 Accounting firms who were not able to handle this type of work. We've helped clients from every walk of life including early adopter technologists, high-net worth investors, crypto hedge funds and middle income earners who happen to have traded crypto. We gain cryptocurrency tax clients from our franchisees who seek them out locally as well as directly through our highly ranked CryptoTaxPrep.com and the various publications that has covered us as first national mover in this space. We expect significant growth in this division this coming year as we now have a refined process and growing team to service these highly profitable clients. Our blockchain focus will continue not only in our CryptoTaxPrep.com and CryptoTaxAcademy.com brands but also in our partnership with Taxmatic which is a do-it-yourself patent approved blockchain tax preparation solution being built. We feel very strongly that we cannot allow another firm to be the Netflix to our Blockbuster. While we are already innovating and creating better ways to file taxes, we need to stay at the bleeding edge as well and empower new technologies that will ultimately disrupt large firms like Inuit in their do-it-yourself models. Our goal by 2028 is to come full circle in the tax business and enable our Happy Tax partners and clients to truly transform the way taxes are done and make them automatic with Taxmatic. In order to accelerate our growth and fully build out our vision, we are continuing to raise capital. We are accepting private, accredited investors and seeking introductions to venture capitalists or strategic investors. And please also always keep us in mind for any franchise or tax return preparation referrals. We are also hiring in our tax department and operations department if you know any passionate tech-forward individuals who want to be part of something special. I'd like to give credit to our core team, our tax department and our franchise partners who have all gone above and beyond and have helped create a living, breathing organization and community that is on its way to changing a stale industry (for the better). Despite being a startup, we have persevered and will continue to do so. You can't stop the unstoppable. Challenging the status quo is built into our core values and our DNA. Thank you for reading and let me know if I can help you in any way.